Ministry of Communications and Information, Republic of Singapore / Handout/Anadolu Agency/Getty ImagesUS President Donald Trump participates in a working luncheon hosted by Singapore’s Prime Minister Lee Hsien Loong in Singapore on June 11, 2018. The White House has released the full schedule for US President Donald Trump and North Korean leader Kim Jong Un’s historic meeting. They also revealed who would be in the room for Tuesday’s highly anticipated Trump-Kim summit in Singapore. 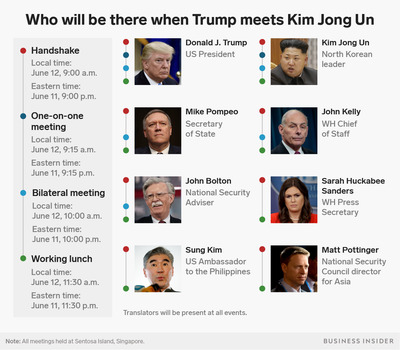 The process is set to begin with a one-on-one meeting between Trump and Kim, and it will be followed by a meeting with some aides present and then a working lunch with even more people. Trump will hold a press conference at 4 p.m. local time (6 p.m. AEST). 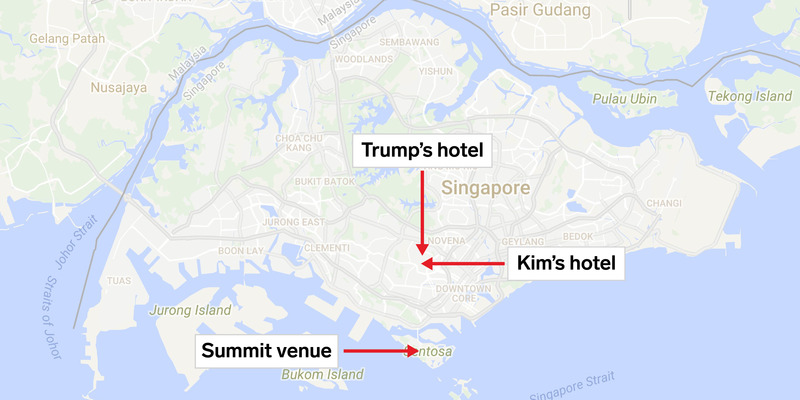 The full details are in, and President Donald Trump and North Korean leader Kim Jong Un are set to meet at a lavish resort in Singapore today. At the Capella hotel on Singapore’s Sentosa island, a popular resort destination, Trump and Kim will first meet at 9 a.m. local time on Tuesday (11 a.m. AEST) for a handshake and photo op. 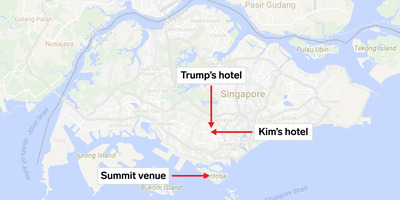 Google Maps; Jenny Cheng/Business InsiderTrump and Kim are both staying at hotels on Singapore’s main island, and meeting on the isle of Sentosa. From there, the two leaders will head to a one-on-one meeting accompanied only by translators, then to a second bilateral meeting with more participants, and finally to a working lunch. After the many meetings with Kim, Trump will hold a press conference at 4 p.m. local time (6 p.m. AEST), then fly back to the White House. Secretary of state Mike Pompeo is the highest-ranking official on the list who has met Kim before. He travelled to North Korea to visit the dictator in May. After that secretive summit, John Bolton angered North Korea when he compared the country’s path to denuclearization to Libya’s, leading experts to believe Trump’s hawkish national security adviser was trying to sabotage the talks. It will be interesting to see how much he participates in the bilateral meeting and whether North Korea takes issue with his presence. Trump is hoping to get Kim to agree to get rid of his nuclear weapons, though he has said it may take many more meetings to get to that point. Kim is hoping Trump will relieve the economic sanctions that have crippled the North Korean economy.